Spirulina is grown in heated basins in greenhouses at Groupe Olivier, in the Nantes region of France. écile Barbière writes for Euractive.fr (translated by Rob Kirby) that, in large greenhouses formerly home to the tomatoes and cucumbers of the market gardening Groupe Olivier, the family-owned business has over the past three years ventured into growing spirulina. Under the leadership of Stéphane Olivier, a PhD in biochemistry, Groupe Olivier embarked on the adventure at their 12-generation old farming site on the outskirts of Nantes, in Western France. Following ten years’ experience in the biotechnological and pharmaceutical industry, the 40-year-old joined the ranks of the family business, in charge of the group’s microalgae branch. “The idea of growing spirulina came from the desire to restore the old greenhouse which was no longer being used for market gardening,” explained Dr. Olivier. The first tests started three years ago. With the support of the European Maritime and Fisheries Fund (which he says was “between €1-2 million,”) Dr. Olivier restored a greenhouse where currently spirulina is growing over an area of 2,800 m2. “This gives us a production capacity equivalent to four tons of dry spirulina a year, which would make us the second-largest producer in France,” he said. 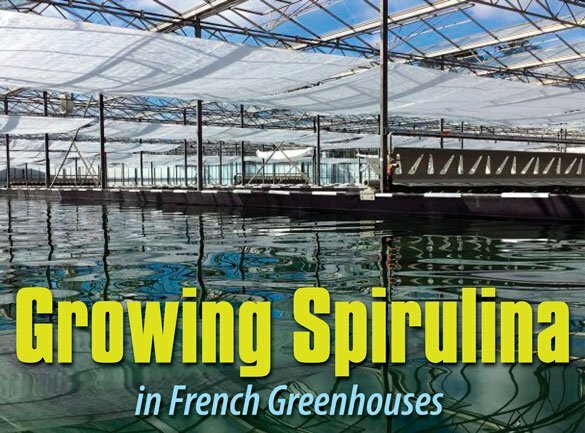 At the intersection of aquaculture and market gardening, growing spirulina in France remains largely artisanal, while the market is taking off. In 2014 the French production of spirulina reached approximately 20 tons, whereas consumption was at around 200 tons, according to Dr. Oliver. Currently spirulina’s supply chain is not subject to any certification process. This is a problem which led to the French Agency for Food, Environmental and Occupational Health and Safety (Anses) to raise the alarm on the quality of imported spirulina. “Our challenge today is to develop European production with higher quality,” said Dr. Olivier.